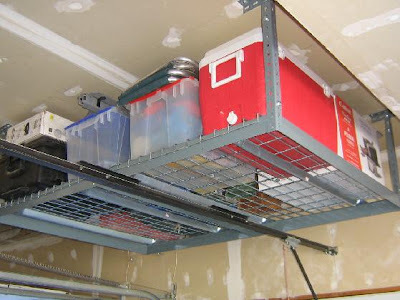 How much wasted storage space do you have in your garage? 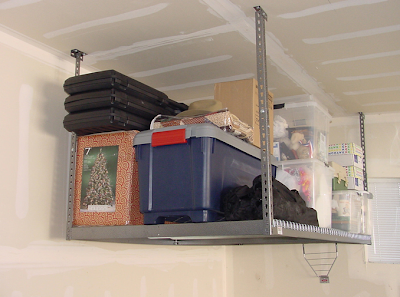 Most people know about wall storage options (pegboards, slatwall systems, etc.) - but they might not think about using all the available ceiling space. 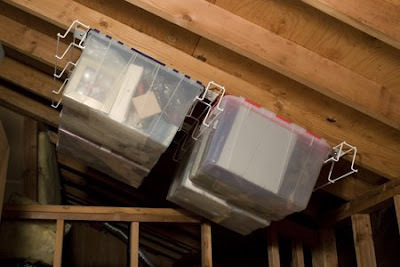 Another option that's easy to overlook involves getting heavy items off the floor. 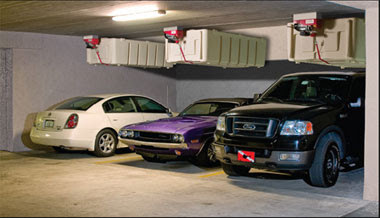 Here are some of the options available to help use all your garage space. 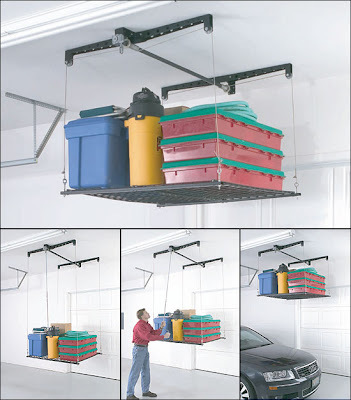 MonsterRAX is another garage ceiling rack. And HyLoft also has ceiling racks. ToteTrac also makes use of ceiling space, but in a very different way. Then there are the lifts. Racor sells the HeavyLift, which has a hand crank. Racor also has a bike and ladder lift. The Loft-It storage lift system is motorized; the video shows it in action. Nu-Cab has the SkyPod elevating storage cabinet - yet another design. The web site has an animation to show how the product works. Update on May 10, 2010: I'm no longer finding Nu-Cab on the web. That Totetrac is cool! I am working on my garage now, so maybe I'll make use of this. 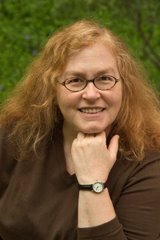 Michele, the ToteTrac was something I learned about at the NAPO conference. Fellow organizer Lorie Marrero liked the ToteTrac, too. The garage is not my domain. If I had my way probably 90% of what is in there would be somewhere else - not in my yard! We have, what is called here in Oz, a "high set" house. The ceiling of our garage is basically the floor boards and joists of our house. The garage is open on all sides, so has limited wall space. Hubby has screwed wood slats across two joists at metre intervals. He then slides all his wood, pipe and steel lengths on these. For heavier and wider loads he had some metal brackets made. Some different shaped brakets that allow him to hook the extension ladder to the 'ceiling' as well. SueBK, thanks for expanding my vocabulary - language fascinates me! My NAPO conference roommate was from Australia, and I had noted in her book all the terms that were new to me - op shops, removalist, rubbish tip, Texta, etc. - which gave her a laugh. Termites are a problem around here in the San Francisco Bay Area, too. We too are told to NOT stack wood against the house. These are some pretty nifty ideas you've got for the garage area. Thanks!